This isn’t the first time I’ve tackled two recent anime back to back. I did the same thing with Free! and Attack on Titan several months ago. Though, in that case, Free was my review for the summer season while Titan was actually a request. Although I did review a fall series, that being Diabolik Lovers, I felt it neccessary to review another show from the Fall Season that wasn’t complete junk. And here we are! 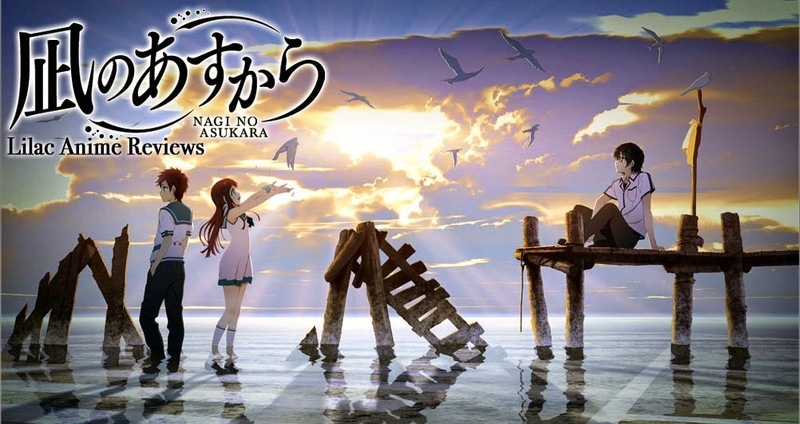 Nagi-Asu is a 26 episode Drama/Fantasy series based on the ongoing manga by Project-118. The series is from director Toshiya Shinohara and studio P.A. Works for the Fall 2013 season. As of this review, Nagi-Asu has been licensed by NIS America and is up for legal streaming on Crunchyroll. The animation for this series is absolutely beautiful! It’s able to give a distinct difference to both the surface and seas worlds with the sea world as something really breathtaking. Even then, the animation is able to make a big change once the halfway point has been passed and we jump forward in time five years. Regardless of whether the sea if alive or asleep, the animation captures it’s beauty really well and makes sure the surface compliments it as well. The soundtrack gives a lot of light pieces that were a nice fit to the series as well as pieces that gave a more traditional sense to the world we see in Nagi Asu. Also both sets of opening and ending themes were pleasant to see, with the second opening being my favorite. While this was airing, myself and others who were watching this series gave it the nickname: “Feels: The Anime”. And, well, that’s this series in a nutshell. There were actually very few episodes where I didn’t cry by the end. At first you think this series is going to be about the politics between those in sea and those on the surface, but as the series keeps going it pulls on your heart strings because there are so many romances and unrequited feelings going on that you are bound to become attached to one character and identify with them. By the end, the series still keeps the love angle going and not much else. This isn’t a bad thing. Like I sad I cried like a baby about 75% of the series. But at the same time, I kinda thought it was going to be something completely different so it made me a little disappointed in that regard. However, this isn’t to say the story of Nagi Asu is junk. It really is beautiful. It just isn’t the series’ strong point. That is more of a product of the characters. In the beginning, we have five major characters: the four sea children plus Tsumugu. In the second half we kind of add one more major character thanks to circumstances around the halfway point along with the time skip. So, I’m going to try and cover all six major characters as best as I can here. 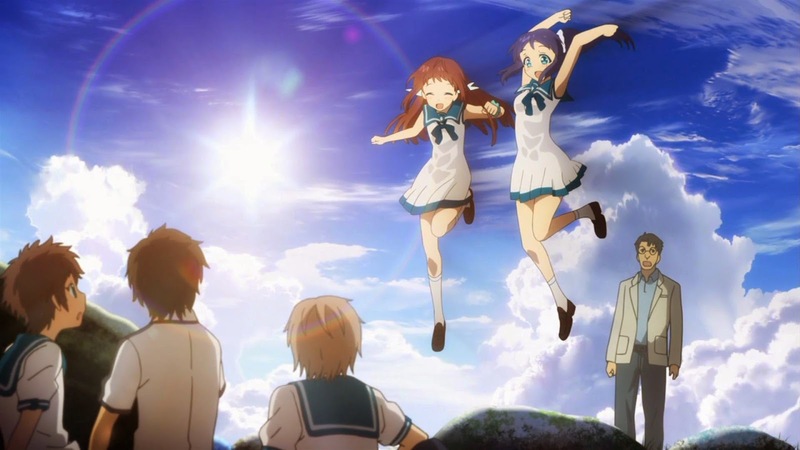 Hikari, Manaka, Kaname, and Chisaki are all originally from the sea. Each are in love with someone and those loves effect the others around them so much that they are afraid of hurting each other and ruining the friendship they established. Luckily, by the end, everything works out as it does in shows like this. Tsumugu is from the surface, however, he is a descendent of someone from the sea. He loves the sea so much that he strives to try and know and understand it. He can come off as a bit stoic and unmoving, but he becomes a lot warmer and gains much more emotion by series end. Finally there’s Miuna, a girl who is born from her father from the surface and her mother from the sea. Miuna is one of my favorite characters in this series. 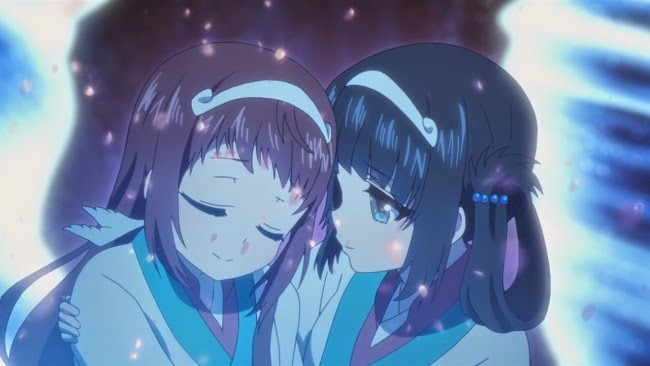 In the first half she doesn’t seem all that important except that she struggles to accept Hikari’s sister Akari into her life as her step mother. In the second half, she becomes a very important character in the series and she grows much more in this half. Overall, we have a wonderful variety of characters and I enjoyed some more than others, but all were still nice to see grow throughout the series. Though some grew more than others. More Japanese voice acting! YAY!!! Let’s do it!! 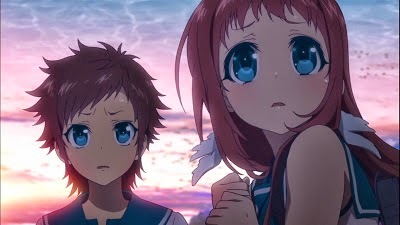 Starting off this series we have Natsuki Hanae as Hikari and Kana Hanazawa as Manaka. Both are wonderfully played out with Hanae giving Hikari a mix of tough guy yet with inner struggle while Hanazawa plays Manaka as such a happy and cheerful girl yet concealing her inner feelings as well. 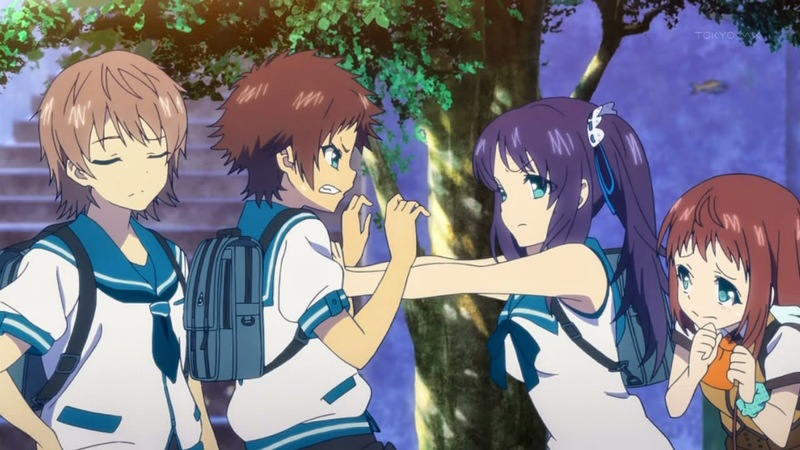 Ai Kayano, Ryota Ohsaka, and Kaito Ishikawa give life to characters Chisaki, Kaname, and Tsumugu and all are wonderfully played with Kayano’s Chisaki being among my favorite performances. Mikako Komatsu’s performance as Miuna was also beautiful to watch and listen to and helped further my love for the character. There’s also fun performances from Kaori Ishihara, Kaori Nazuka, and Kousuke Toriumi as they take one Sayu, Akari, and Uroko-sama. Overall, it’s a rather strong cast. By then end of the festival, Nagi no Asu's biggest strength is that it's really emotionally driven. It manages to, somehow, make you cry a lot because you become attached to these characters and are able to identify with them in some way. But this isn’t the only good point about series. The animation is beautiful, the soundtrack is simple and easy to listen to, and the characters are well diverse in both inner and outer struggles. Though the story can be slightly cliched at points, you should go into it knowing it’s going to get sappy and it’s going to be a little over done in the romance department. 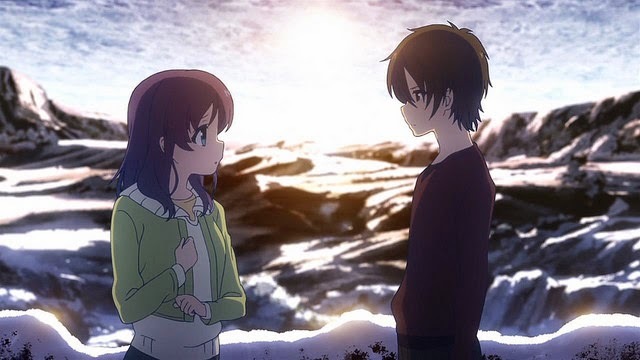 Either way, Nagi-Asu: A Lull in the Sea is my favorite series from the Fall 2013 season. At least until I finally finish up all the other ones I’m way behind in. Next time, we gain a rather interesting diary. Until then, otaku on my friends! Final Rating - 7/10 All of the feels... All of the feels forever! 28/m, here and the fantasy pulled me in with the beautiful animation and great music and seeing the sea god and underwater town but then the love started and i found it fresh that each person loved someone but the person they loved, loved someone else instead so the love they feel is never returned. so to me its like a 6-way love triangle or hexagon maybe, either way simply amazing. me personally i loved miuna the most.